I am exhausted. This was an excellent day to clean out my fridge by making Summer Vegetable Soup. This weekend I stayed in Manhattan with a group of East Coast French Friday with Dorie participates. We call ourselves Doristas. We met on Friday and ventured over to 9th Avenue, this area is affectionately know as Hell's Kitchen from it's days as a rough and tumble slum area. These days it is the kitchen to many interesting inexpensive ethic restaurants. We had an excellent Thai lunch at Viv that included a starter and a main course for $28 for 3 people... not bad for Manhattan. This lunch was a good balance to the extravagant dinner we had that evening at La Grenouille a French restaurant that is a New York institution. It has been in business for 50 years and it still receives excellent reviews. 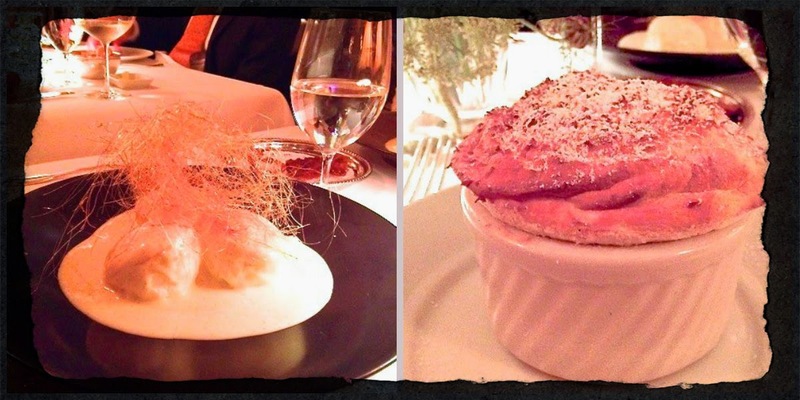 Floating Island and Soufflé desserts at La Grenouille. We made both of these in our cooking group. There are not many places that the Dorista's can dine on French food that is any better than what we can make at home.. La Grenouille truly topped our home cooked versions of many classic French meals. Plus, it's legendary floral arrangements were truly magnificent. We spent Saturday shopping for foodie supplies: spices, salts, oils, and other exotic ingredients plus a a little bit of chocolate and some delicious baked goods at Chelsea Market. In the afternoon we strolled through the High line park which is a raised railroad track that has been converted into a park. In the evening we retired to a tasty Italian meal near our hotel, Bistro Milano. It is astounding how this international cooking group has brought so many people together... from the East and West Coast of the US... to Canada, Italy, Argentina, Germany... I just have to say thank you Dorie Greenspan for having us around your French table. You have enriched our lives with both good food and new friends. Yes, and the soup... well, I'm back home with a fridge of wilting vegetables, so I threw this soup together in a simpler way than the original recipe. I made enough technique alterations to it that I will share my adaptation with you. 1) Heat EVOO on medium high heat in a large sauce pan. Add the dried herbs to the oil so they can bloom. Next start by chopping and adding to the pan the densest vegetables to the lightest ones: onion, garlic, carrots, potatoes, green beans, corn and lastly tomatoes. Sprinkle a bit of a salt and pepper on eat vegetable as you add and stir it. 2) Once all the vegetables wilt a little add the broth and the bay leaf and bring the soup to a boil. Low the heat and let it simmer for about 10 minutes. It is done when the potatoes and carrots can easily be pierced with a fork. NOTE: I like to let my soup sit for hours. The flavors really blend more over time. 3) While your vegetables are simmering put a bunch of basil leaves in a food processor (a mini-processor is great for this) Add about one tablespoon of cheese and EVOO and give it a spin on high. Check if it is smooth enough for you, and if it is cheesy enough, if not add another tablespoon of EVOO/cheese.. continue until you get the consistency that you like. 4) Drizzle each bowl of soup with the pesto and serve with a big piece of crusty buttered bread. Hi Diane, The soup looks delicious. Happy you enjoyed such a wonderful time in New York with fellow Doristas! The meals sounded good, just love walking around New York and exploring... especially fun cooking supplies and ingredients! Thanks for sharing. Yes, for me this was a first time meeting and it is so wonderful to really get to meet the people you blog with regularly. NYC is a great foodie city... it is so easy to eat well there. I loved reading this post, especially the descriptions of your weekend in New York. I haven't been to NYC in 10 years, hopefully one day...I'm glad to know your simplified soup recipe worked just as well. Dorie's recipes do seem fussy occasionally. Whenever you want to come to NYC I will take you around. It is a foodie heaven. I know you are with me on the fussiness.. boil 10 min add, boil 10 mins add... totally unnecessary. Thanks for the highlights on all the various places of interest, you ladies sure had fun! Let's enjoy the simple dishes at FFwD while we can! Soup's FAB! Hopefully we can do this again next year and more people can go. I especially love the photos from your Dorista gathering!!! But your soup looks wonderful, too!!! Thanks Liz, I didn't take the Dorista one... some very nice young man who was leaving the restaurant with us took several until we got good lighting... thanks to the kindness of strangers. LOVE the photos from the Dorista meetup :) I hope there will be a next time soon! We will have to try to arrange it when you are not in France. It would be terrific to meet you. Yes, I think too many people think you have to follow a soup recipe exactly.. but it is best made from wilted things in your fridge. Diane, Very nice post! We did have such a lovely time in the city! The food and company were fabulous! Your soup looks so mouthwatering…I like your alterations! Have a great weekend! I think we had a terrific variety of meals and some delicious snacks. I kids goobled up my ricotta fig chews... I thought for sure they wouldn't be interested in them.. who am I kidding they have Mediterranean taste buds....speaking of which, I am really bummed that I didn't buy the yogurt you got. I am still thinking about it. Hope you are enjoying it. seeing all the photos from everyone. Tricia and I did the Chelsea Market awhile back and it was fun. Manhattan is a great place, worked on 14th Street for about 7 years at Con Ed and explored everything. 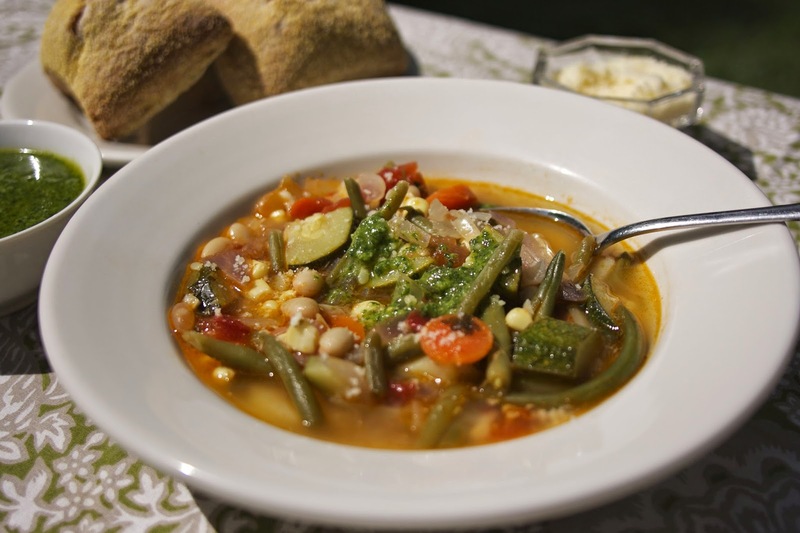 Great soup recipe this week, perfect for summer with all the fresh veggies. We will get together again and you two will make it... I feel it will happen. Yes, soup and quiche are my favorite ways to clean out the fridge. I love how we're all friends when we meet in person! It looks like you all had a lovely time! And your soup looks wonderful! It is the coolest group. I haven't heard of any other cooking group getting together in person as many times as we have. What a great post. I have to admit to being a bit envious! I feel like I'm one of the last Doristas to meet up with others. Maybe this summer/fall in SoCal, since I'm doing some work there. I really need to break out that atlas! Your adventures look so wonderful and I'm happy that you had such a great time. I thought this soup was really good too - I agree with the "fussiness" part, but this worked into my "laziness" since it gave me time to prep things... I didn't follow times exactly. You'll have to see Trevor, Susan, and Alice, maybe even Mary if she winters again in CA. what a great visit you had! Do you like to make pesto without nuts? I'm intrigued, I never seen it that way! Your soup looks great!! Nut free pesto is fine as a garnish, but not flavorful enough for the main focus, like in a pasta dish, then it lacks depth. 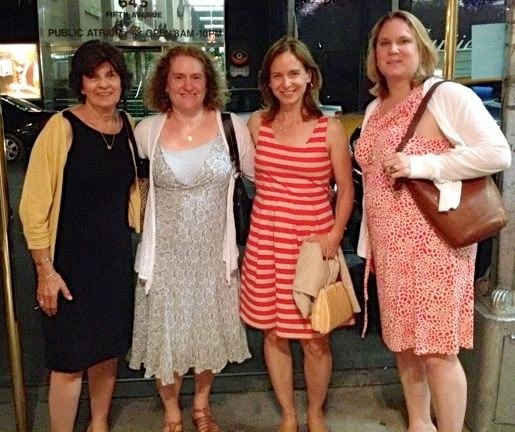 I've just come from Kathy's blog - loving the photos of you all living it up in NYC. This soup was pretty good, and I think is adaptable in many ways while still remaining true to the theme. Glad you enjoyed the pics. We had a great time. 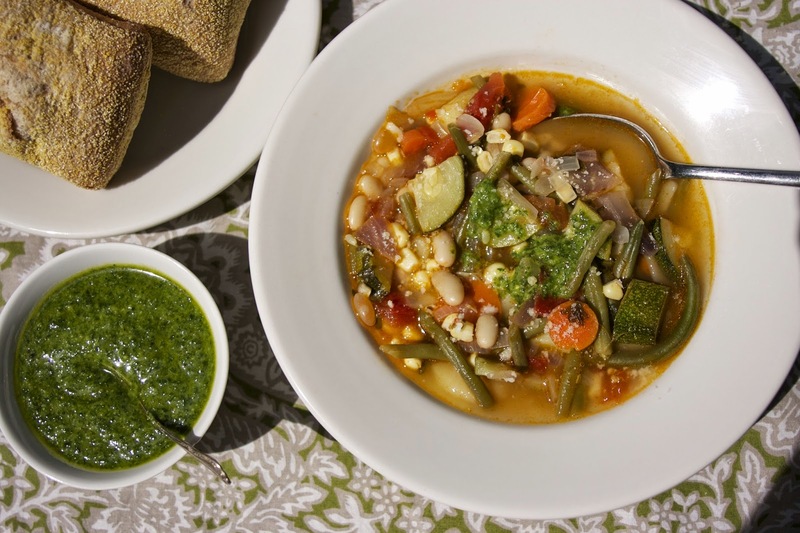 Yes, I think as long as this soup has summer veggies and corn and you put in pesto it is in keeping with the recipe. This was a delicious pot of soup, and I like your simplification. It was such a pleasure to spend last weekend with you. I felt like we were old friends from the moment I arrived at your house, and like I'd always known you by the time we arrived in Manhattan. Looking forward to seeing you again for another foodie adventure. Thanks so much Betsy, I felt exactly the same way. Until we meet again. Beautiful soup. Love the pesto! I can't wait to taste this, Diane. I'm jealous of your New York Dorista weekend - how fun! Even though I followed the soup recipe pretty much to the "T", it is definitely one of those recipes that can be tweaked and changed and still keep to the spirit of the recipe. Yours looks delicious! I've been the jealous one for so long looking at all the West Coast meeting. We are slowly all getting together. Love the striped sundress. I am happy that orange is the new black in Manhattan these days. You four had the weekend I visualized for you and even more. La Grenouille. That's a wow. I am wondering if NYC prices compare to Paris and even Robuchon and Guy Savoy in Las Vegas.Saturday would have been my favorite, hitting all the foodie haunts for hard-to-find goodies. Glad this was an easy recipe for you and for your leftovers, Diane. I think your photos are wonderful and I appreciate your posting your adaptions every week. The prices are better in NY. I think in general you get the most bang for your buck here. LOL orange is the new black. We will get you to NYC, even if it means that Trevor has to come pick you up on one of his road trips and fly you out here with him. This looks very nice but since it is over 104 here....and humid....I think I will make it a fall soup! 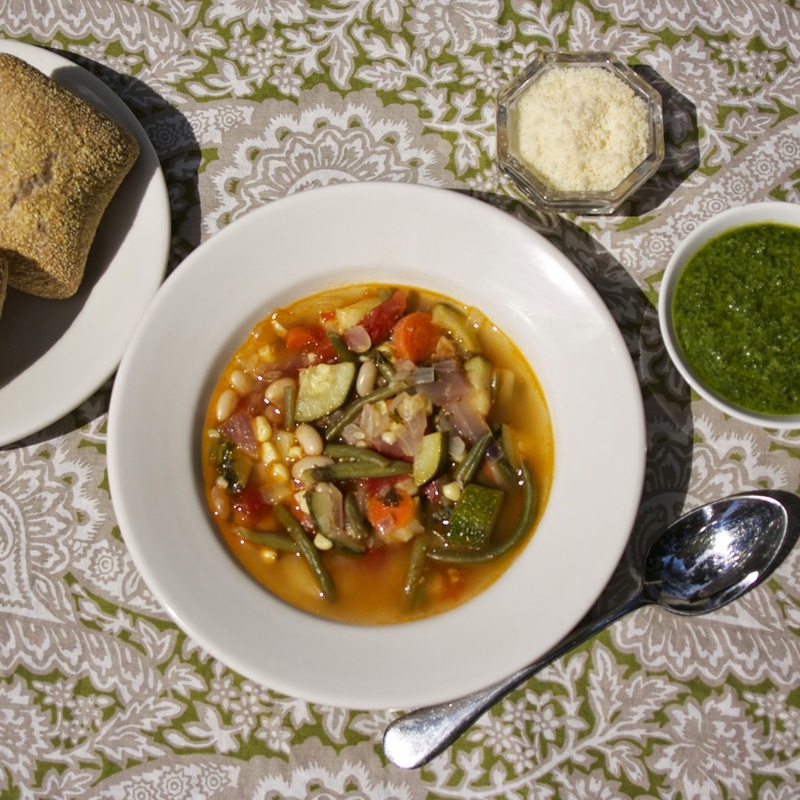 Mediterraneans serve soup all summer. Just serve it at room temperature. It is a very light soup. This soup begged for shortcuts! We did have a great weekend and it was so nice to meet up with you finally! Yeah, all those ten minute boil times made me crazy. An absolute pleasure meeting you too. The corn and the pesto really make it summery. Thanks for pinning and tweeting it. 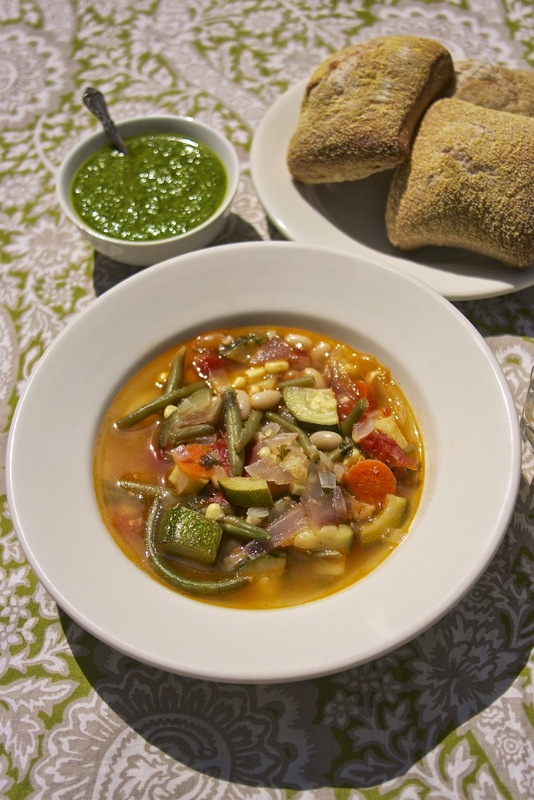 Delicious summery soup, thanks for sharing with Hearth and soul blog hop. pinning it. I finally posted about this soup, so I'm finally getting around to everyone's posts. I just made it under the wire for this to be a summer soup - it had some of the last vegetables from this year's garden. Your simplified version sounds great and easy. Love the photos and stories the four of you have from your weekend together. It's been a wonderful experience getting to know everyone, even online. Glad you got this soup in... yes, everyone in the group is fantastic..even more so in person. I hope I get to meet everyone at some point.